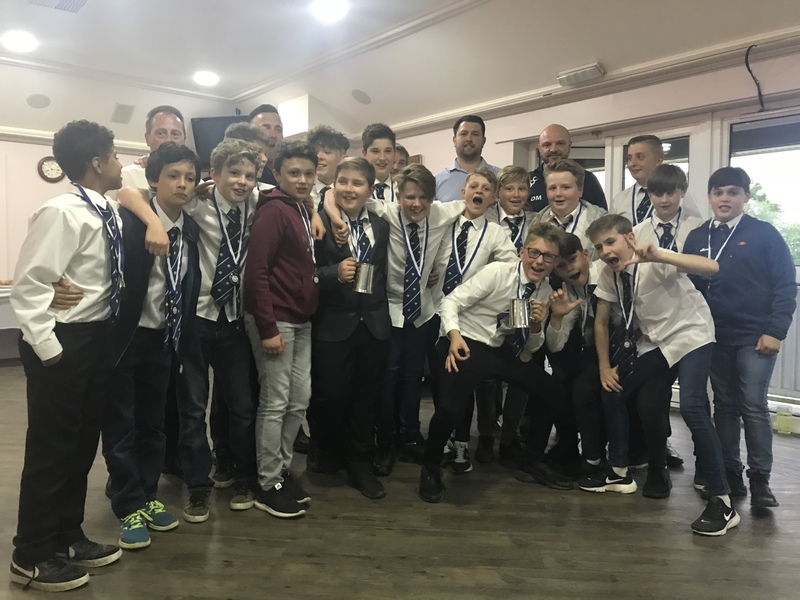 The East Grinstead U13's travelled to the Cinque port of Hastings, to take on league table toppers Hastings and Bexhill, knowing victory would cement them as League winners, and gain them instant promotion on the last day of the season. On the back of a dominant performance last weekend against Edenbridge, momentum was on our side, and the confidence was evident as the ‘Robs' ran the boys through their pre match warm-ups. The sun was beating down again as both sides took to the field for KO. Hastings and Bexhill chose to receive, and the game was underway! Hastings took control of the ball from the start, until Skipper Galbraith put in the first big tackle of the match, with Grinstead effecting a turnover straight from the off - what a start - both teams are looking strong, and it's Hastings who win the first scrum of the game; moving the ball out from the base of the scrum the Grinstead defence rushes up to meet the attack, and between them, both Finlay Neal, and Ozzy execute a perfect choke tackle, and even manage to rip the ball free of the attacker's grasp. The ball is moved sweetly through our back division, and its the Galloping Galbraith who crosses the white wash first. Hastings and Bexhill’s fly half demonstrates a penance for kicking the ball from early on, a tactic that was to pay dearly throughout the course of the match, but one we hadn't faced that often. However good positioning from full back, Noah Roberts, made sure the ball was often returned with interest, along with mobile Max Godfrey and the ever willing Big George Naylor, the opposition were being scattered like ten pins, as George was defying his broken toe to run amok through the Hastings mid field! It's certainly all East Grinstead at the moment, as we are camped on the opposition 22. Hastings are not top of the table without reason though, and demonstrate some very strong running of their own, and in a moment the boys find themselves back in their own 22, and defending hard. Hastings have a scrum in centre field, about 20 metres out from the try line, their backs are split left and right behind the scrum, but defence is something the team pride itself on, and once again the pressure is soaked up, and Grinstead break out to the half way line. This is a gripping game!! Ginger ninja Sid Evans dances his way out from the base of a ruck, ghosting past defenders before being stopped, but a quickly recycled ball sets Fleet Footed Félix free to score. Hastings restart, and almost instantly it's George Naylor, who smashes his way through tacklers once more to quickly add another. Hastings go long with the restart, and Zach Bradbury watches to see if the ball will run over the try line, it stops rolling agonisingly short, and he has to collect. He sells the on rushing chasers an audacious dummy, and scampers off up the left wing, making progress to the 10 metre line, where he is eventually dragged down. The forwards pile in and clear out the defenders, and the ball is recycled quickly, to set up fly half Ginger Sid Evans, who bursts through despairing tackles right on the stroke of half time to run in from about 25 metres out. Half time and Hastings generously supply a big bag of oranges for our refreshment. Hastings need to do something quickly to get back into this game, but once again full back Noah is well positioned to return kicks, and runs well out of his own ‘22, ably supported by the slippery little winger Harry Smart Williams, who sythes his way through the Hastings team to record another try for East Grinstead, this is not what the home team needed, and now like the famous East and West Hills funicular railway on the sea front, the home team were facing a very UPHILL task …. The home team are now under some pressure, and respond as you would expect them to, as wave after wave of attack lands on East Grinstead try line. For quite some considerable time the Grinstead boys are under attack, but that never say die attitude they possess sees the try line protected at all costs; and the pressure is relived once more as fleet footed Félix breaks out up to the half way line, he even seems to have taken his own team mates by surprise and finds himself a little isolated when finally tackled, and a knock on gives Hastings put in at the scrum. Hastings again make good with their possession and push Grinstead back towards the 22 metre line, but yet again its skipper Iain Galbraith who finds a way round the opposition and over the line once more. The heat now seems to be taking its toll on the brave young men of both sides, as the battle of Hastings (sorry, how could I not include that phrase….?!) continues. ‘Bradbury' secures an effective turn over at the tackle area, and it's that lad Ozzy who once more powers through a tiring Hastings team, who to there credit have never ever shown signs of giving up, or dropping their heads, but it's another score to Grinstead. The home team continue to press hard, and it's defensive effort that the boys must muster once more, step up Jack Jacobs, who executes two successive monster hits from two successive tap penalties. As is the way with a tap penalty, the balls goes to your largest forward who runs headlong at the defensive wall, Jack steps forward both times, and the resulting tackles are greeted with applause from both sets of supporters and Jack's team mates alike, a defensive show like this lifts your team and so it proved, as once more strong defence turned into powerful attacking rugby. Big George brushing would be tacklers aside to sprint three quarters of the field for a second try. This has been another dominant and determined display of rugby from the boys, and with the final whistle nearly upon us, there is still time for one more try, and its Galbraith who wraps things up and secures both the victory and promotion into the next division. Everybody stepped up to the plate this morning, and each and every one of the squad should be rightly and justifiably proud of their achievements this season.